Also serving communities of Miramar Beach. There are 5 Assisted Living Facilities in the Niceville area, with 4 in Niceville and 1 nearby. The average cost of assisted living in Niceville is $4,187 per month. This is higher than the national median of $3,346. To help you with your search, browse the 42 reviews below for assisted living facilities in Niceville. On average, consumers rate assisted living in Niceville 3.5 out of 5 stars. Better rated regions include Shalimar with an average rating of 3.9 out of 5 stars. Caring.com has helped thousands of families find high-quality senior care. To speak with one of our Family Advisors about assisted living options and costs in Niceville, call (855) 863-8283. One of the best places to retire in Okaloosa County, Florida in 2018, Niceville is a small town along the Boggy Bayou that offers plenty of green space for seniors to explore. A little over 15 percent of the city’s 15,249 population is over the age of 65. To accommodate that population, there are eight assisted living facilities within the area and four within the city limits. These facilities are governed by the Bureau of Health Facility Regulation, and they operate under a standard license providing routine personal care or a specialty license for those who require limited nursing care. Seniors who prefer warm temperatures may enjoy Niceville’s lack of snow and mild winters. Summer highs are around 89 degrees, and winters are short with lows near 40. Higher than the national average of 100 and the Florida state average of 111, the cost of living in Niceville is 117.8. Seniors on a budget may find it difficult to manage money within the city limits. Crime is ranked on a scale from 1 (low) to 100 (high). In Niceville, property crime is ranked 26.7, which is lower than the national average of 38.1. Violent crime is ranked 10.9, which is also lower than the national average of 31.1. Seniors who live in Niceville can feel safe when shopping or sightseeing on their own. The Niceville area is home to world-class medical facilities, including the Twin Cities Hospital, in the event of medical emergencies or illness. Find-A-Ride Florida matches seniors in Niceville with transportation to and from various errands and medical appointments. The service is available to seniors 60 and older at discount prices or for free. Niceville has an array of community resources for seniors, including the Florida Department of Elder Affairs, an organization that seeks to improve the quality of life of seniors in the area, as well as one senior center. Assisted Living costs in Niceville start around $4,187 per month on average, while the nationwide average cost of assisted living is $4,000 per month, according to the latest figures from Genworth’s Cost of Care Survey. It’s important to note that assisted living rates in Niceville and the surrounding suburbs can vary widely based on factors such as location, the level of care needed, apartment size and the types of amenities offered at each community. 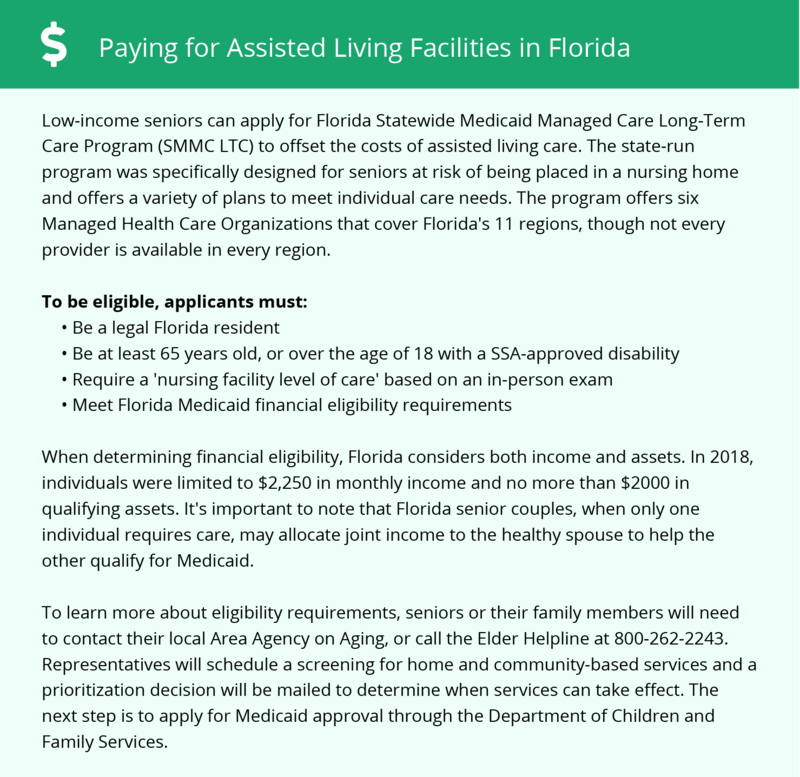 Seniors may be eligible for financial assistance to pay for an assisted living facility in Niceville and the state of Florida through the statewide Medicaid Managed Care Long-Term Care Program for facilities that operate under a standard license. An additional waiver, called the Assistive Care Services waiver, is available for seniors who live in a specialty-licensed facility. Eligibility for both programs is determined by the Department of Children and Family Services. To see a list of free assisted living resources in Niceville, please visit our Assisted Living in Florida page. Niceville-area assisted living communities must adhere to the comprehensive set of state laws and regulations that all assisted living communities in Florida are required to follow. Visit our Assisted Living in Florida page for more information about these laws.